Human resource departments have comprehensively benefitted from AI supported systems and software throughout their work domain. Any job opening in a major organization typically invites hundreds of applications, yet only 10% of the incoming resumes are relevant! Imagine placing a job advertisement in a newspaper and bracing for the deluge of applications that would consume weeks of your time to sift through. This is how the process of recruitment was initiated in organizations across the world till a few years back. Thanks to the advent of artificial intelligence supported systems, this extremely cumbersome process is now taken over by software and search algorithms that are able to successfully prune out the few people matching your requirements from a pile of irrelevant applicants. This is just one manifestation of the way artificial intelligence is re-shaping and revolutionizing every sphere in our lives, including human resource management. Not just talent acquisition, human resource departments have comprehensively benefitted from AI supported systems and software throughout their work domain. Processes like onboarding, performance review, feedback, training, retention etc. has not only improved efficiently but also reduced on a lot of administrative tasks, thereby allowing human resource managers greater time and energy to focus on mentoring and motivating employees. Short-listing relevant candidates is just the beginning of the HR’s involvement with employees. In addition to resume review are a series of essential tasks required to push the candidates through the recruitment process such as scheduling interviews and sending reminders for reporting. Automating such administrative tasks can save a lot of precious time besides helping make the hiring process quicker and convenient. A wise interplay of automation and human engagement implies greater efficiency and timely delivery of information and correspondence. On the other side, AI recruiters come with an understated yet significant advantage eliminated unconscious human biases in short-listing candidates. Apart from talent acquisition tools that help speed up recruitment, organizations today are looking to extensively use artificial intelligence backed programs for onboarding. As a new employee, you typically expect to be welcomed to an organization and briefed about your job profile and other important matters. Imagine, a new employee reaching his desk and finding all new hire information in an app or on his laptop, with all details such as reporting authority, team members and tasks assigned for the first week at work. At the same time, creating mechanized systems that will answer all of a new employee’s queries are ideas that are changing the way routine administrative tasks are done at organizations. 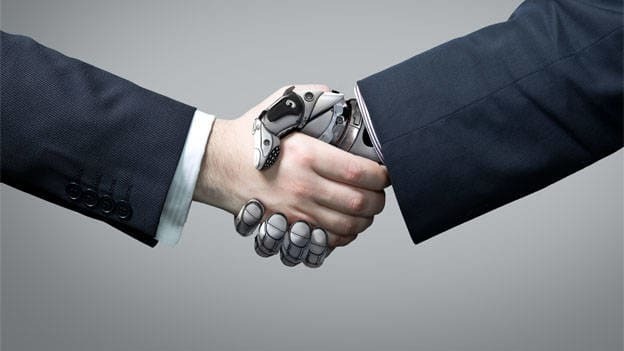 Physical presence is one the biggest challenges confronting HR managers and use of artificial intelligence-backed tools is increasingly playing a greater role in performing routine administrative tasks. This unshackles HR persons from the burden of cumbersome routine, involving repetitive low-value tasks and allows them time to focus on more productive and strategic work that require greater interpersonal approach. A lot of repetitive and low-value tasks often consume a huge amount of time and energy on the part of HR managers. Take for instance, repetitive questions that employees often ask regarding policy matters, including basic Do’s & Don’ts and standard queries pertaining to leaves and appraisals. Such problems can be easily resolved by using AI-powered tools to create electronic employee helpdesks where users can feed their queries and receive automatic responses. At Sun Life Financial, we are working to create an HR bot where users can simply punch their questions and receive answers without the need for interaction with an HR manager. The power to leverage Big Data also allows us the ability to track not just employee performance but also employee mood over a period of time. Already there are AI platforms in the market created to identify employees that might be heading out. By tracking employees’ activities such as their browsing history and emails for a brief period, these programs can single out such employees and report to the management for corrective action. Similarly, moodometers created to track employee sentiment over a period of time are aiding in singling out disgruntled employees. By giving the administration a head start and a fair idea of which employees need to be talked to, these programs are aimed at helping organizations’ retention strategies. While most skilling and learning programs are usually led by managers and HR executives, a series of AI supported programs can be used by employees to improve their skills. For example, organizations are investing in gaming-based programs that help employees build their key skills while ostensibly playing computer games. A lot of aspects of learning and development have today moved into the self-service domain. Short duration digital courses based on micro learning allow individuals to seek learning in an online module without the need of any real time classroom or teacher. While AI has been influencing our lives for decades, in HR its disruptive emergence can be traced back to just a few years. Actual disruptive technology started pouring in over the last couple of years, with significant money being invested in the domain and revolutionary products being developed. As we move forward, we are looking at major AI-influenced changes transforming HR. With people becoming more and more technology savvy, we are looking at implementing several tools and systems that automate repetitive tasks. Self-service kiosks for employees to self generate joining letters, pay slips, form 16 etc might be on the anvil. A survey of HR executives by IBM in 2017 found that half of them recognized the power of cognitive computing in transforming key dimensions of HR. This is clear indication that AI is set to become a redefining force in HR.